Woods teed of at 8:51 a.m. on Friday at No. 10 with Marc Leishman and Chez Reavie. He started off shaky on the back nine shooting 2-over. All day Woods kept missing short birdies chances as they either rattled out or he’d missed the hole by mere inches. Woods recovered on the front nine shooting 1-under, but an opening round 72 (+1) wasn’t exactly ideal for the 14-time major champion. Sporting News tracked Tiger’s score and provided live hole-by-hole updates below. Woods’ tee shot nearly makes it into the right green side bunker, but it falls just short. Low chance of a birdie at this point. Chips it up onto the green, but he’s not even close to the hole. Looking at a 24 or 25-foot par putt here. He sinks the putt for a terrific par save. Tee shot misses the fairway and lands in the right rough. Moves it up along the fairway into the left rough. His third shot lands within eight feet of the pin and he’ll have a shot at a birdie. Misses the birdie putt and settles for yet another par. Another tee shot, another fairway for Woods, this time of the right side. His approach lands on the back side of the green on the fringe. He’s about 50 feet from the pin. Runs it onto the green just short of the hole. Follows it up with another par. Hits the fairway with his tee shot, still a ways to go, but he’ll have a chance at the green. His second shot doesn’t make it to the green, but rather the left green side fairway. Chips it onto the green just over 10 feet from the hole. Nice chance for another birdie here. He misses the birdie putt by inches and taps it in for par. Tiger’s front-nine line: 6/7 fairways, 5/9 GIR, 13 putts. Woods overshoots the green on his tee shot and lands in the rear green side rough. He tries to chip it up onto the green and he doesn’t give it enough power and stays in the rough, Finally manages to get it on the green with his third shot and rolls past the hole to the left. Sinks the ensuing putt for bogey. He crushes his tee shot 335 yards and then finds the green with his approach. He’ll have a 30-foot chance for birdie. Misses the birdie putt by a few feet and rattles it in for par. 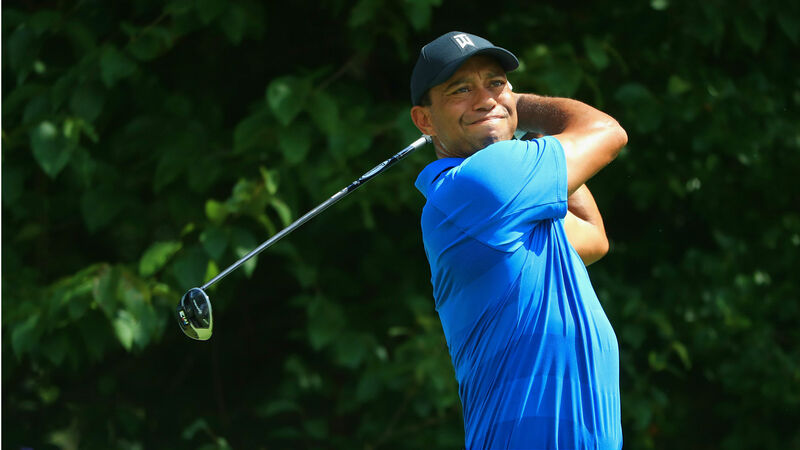 Woods’ 275-yard tee shot finds the fairway again. His approach shot finds the left rear green side bunker. Chips it on to the green and it runs past the hole. His fourth shot is just short of the hole and he settles for bogey. Nice start to this hole as his tee shot goes just over 300 yards right down the middle of the fairway. Second shot finds the green and he’s looking at another long birdie putt. Misses the birdie by inches and taps it in for another par. Tee shot is off the mark as he hits it to the left of the fair way into the rough near the tree outline. Woods decides to take a drop and is assessed a penalty. He overshoots the green with his next shot and his ball lands in the rough to the back. He’s about 24 feet from the pin. Woods chips it in from the rough to within six feet of the hole. Starts off the day with a bogey.